We continue our series of staff reflections on various issues from a transnational historical perspective. Dr Tomasz Kamusella FRHistS, is a Reader in Modern History. He is the author of the extensive monograph The Politics of Language and Nationalism in Modern Central Europe (Palgrave 2009). During the last two centuries much scorn has been poured on the Holy Roman Empire that was dissolved in 1806, after the millennium when it had been the robust pillar of stability placed squarely at Europe’s center. Critics of the empire have not tired yet of repeating Voltaire’s quip that ‘This agglomeration which was called and which still calls itself the Holy Roman Empire was neither holy, nor Roman, nor an empire.’ The pronouncement’s emphasis on ‘agglomeration’ amounted to a disparaging comment on the fact that this empire was composed from an intricate lattice of over six hundred overlapping and interlaced polities enjoying sovereignty and direct recourse to the imperial institutions, including the emperor himself. Apart from these first-rank polities, the empire was also home to around two thousand more polities and territories of limited sovereignty, including free imperial villages. The mass of polities and polity-like territories of various statuses and privileges let their rulers and inhabitants work out variegated ways of governance suited best to the local social and economic situation, with no need of involving the busy and distant emperor. This kind of self-government facilitated changing the arrangements obtaining in a polity in flexible reply to political events as they unfolded either at the local, imperial or all-European level. The absence of any formal capital in the empire (which now would be unthinkable in a present-day state) allowed for even more self-governance. 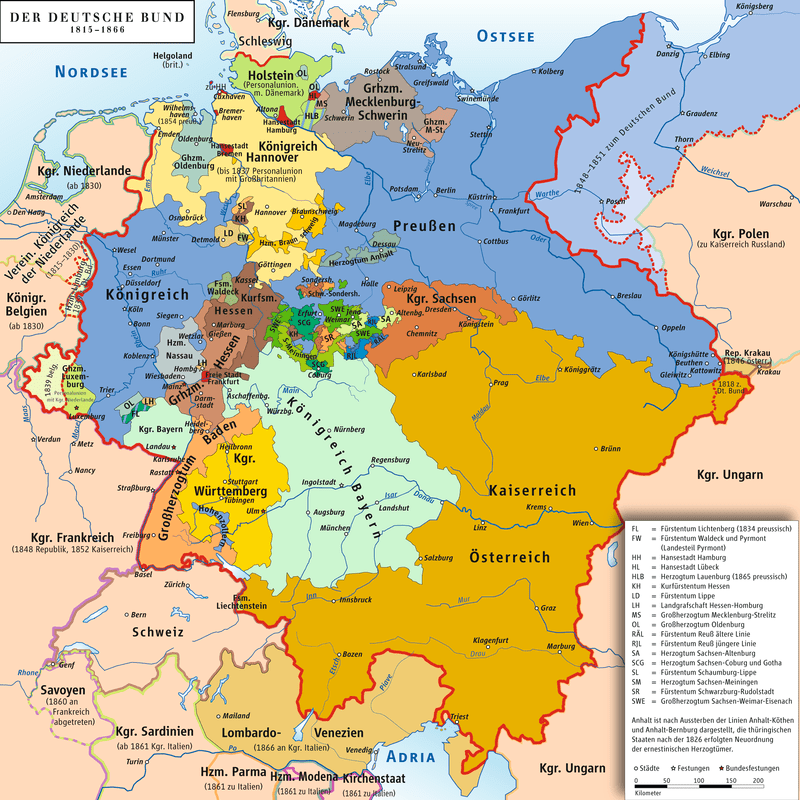 The beginning of the end of the Holy Roman Empire was the Thirty Years’ War (or the most devastating military conflict in Europe prior to the two world wars) that was concluded by the Peace of Westphalia, that is, the series of treaties signed between May and October in 1648 at the cities of Osnabrück and Münster in the Duchy of Westphalia. This peace finished the period of religious wars between Catholics and Protestants, and yielded the international system of states as we know it today. Following the bout of decolonization in the second half of the Twentieth century, this system, from its modest beginnings in Westphalia, spread all over the globe. 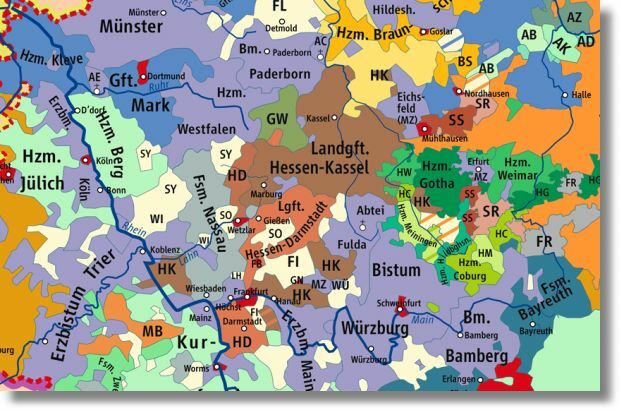 The so-called ‘Westphalian order’ is founded on the model of territorial state. It assumes that the state to be legitimate it should come in a continuous block of territory, and its homogenous (then in confession, while today in citizenship or ethnolinguistically construed nationality) population must be governed by a single ruler enjoying absolute sovereignty within the polity’s boundaries. By the same token, no other states have the right to intervene in the polity in question, and ideally, its boundaries should be stable and inviolable. The latter principle increasingly limited the influence of dynastic marriages on state borders. This new model of statehood, associated with modernity, spelled the end of the traditional polity as obtaining in the Holy Roman Empire. Before 1648 no one thought much either of the fact that a state could be composed from a myriad of disconnected – and often far-flung – territories, or that a polity or its different regions could be co-ruled by several monarchs. After 1648 overlapping jurisdictions fell foul of the principle of homogeneity, and similarly, enclaves and exclaves lost their popularity: the insistence on territorially continuous states won the day. Before 1648, the then obtaining political imagination allowed for thinking about states as tri-dimensional objects. Practice showed that it was not beyond the monarch’s and his subjects’ capacity to travel from one territorial islet of their polity to another crossing the territory of a third polity. This was done before the age balloons, airplanes, helicopters and spacecraft, when most believed that Earth is flat. Modernity – heralded by the territorial state, and the industrial and French revolutions – convinced almost all that our planet is a sphere hurling through space and gave us the means to test it with our own eyes, when we have a chance to travel on board a plane flying at the altitude of ten kilometers. At this height the curvature of Earth is clearly visible. In several hours you can move from one continent to another, observing on the in-flight screen numerous states over which the plane is passing. Despite these technological and scientific developments, so widely available nowadays, but utterly unimaginable when the Holy Roman Empire still existed, our modern political imagination became hopelessly flattened. The Westphalian model of territorial state compels us to believe that polities are ‘naturally’ two-dimensional objects. Hence, one of the main tasks of European diplomacy in the first half of the Twentieth century was to rid the continent of remaining enclaves and exclaves, quite successfully completed after World War II, especially on the communist side of the Iron Curtain. 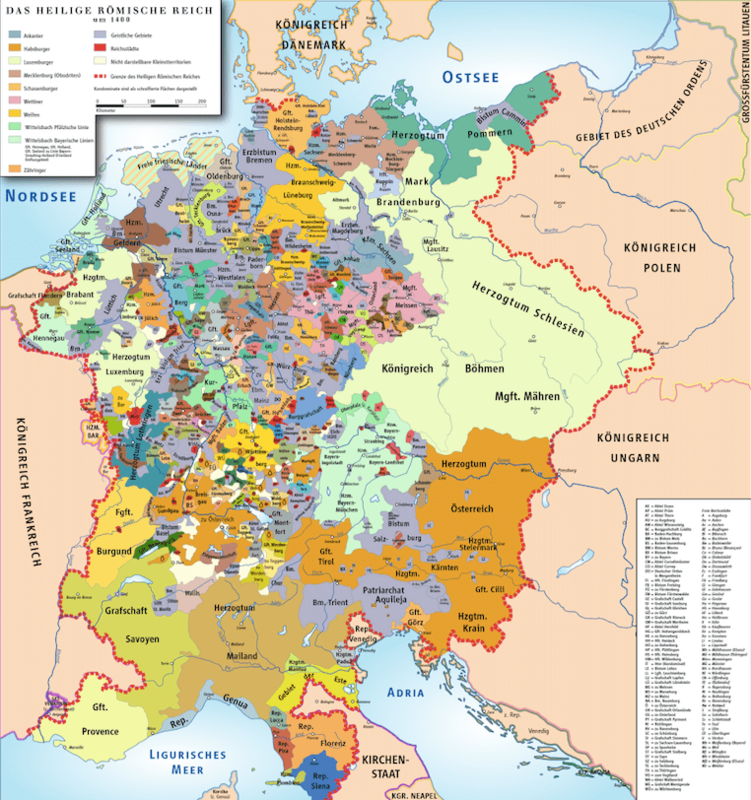 In the Nineteenth century, early practitioners of political science and proponents of a German nation-state similar in size and homogenous character to revolutionary France, coined the German term Kleinstaaterei for the presumed ‘disease of too small and territorially discontinuous states’ in the Holy Roman Empire and the German Confederation that replaced the former between 1815 and 1866. Perhaps, in the taxonomy of illnesses suffered by the political, ‘flatnessity’ or ‘2-dimensionalenza’ is an apt label for the serious constriction of political imagination so characteristic of modernity. This entry was posted in reflections by tdk2. Bookmark the permalink.